In an editorial published 1 April (which was not an April's Fools joke) Jamaica's oldest and leading 'newspaper of record' The Gleaner has published its strongest call for the island to end discrimination against LGBT. Specifically it wants sexual orientation included in the Charter of Fundamental Rights and Freedoms, an addition to the Constitution now before the Senate after twenty years of proposals but inaction on the subject. 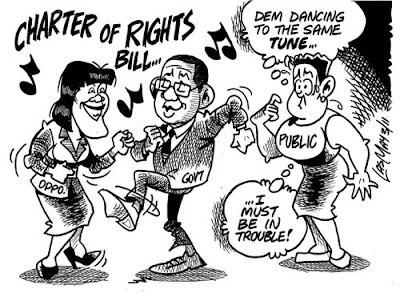 The Charter was first proposed by former Prime Minister Edward Seaga, who has described it as "an instrument which would curtail abuse of the rights of the people by the state." This is not the first time the newspaper has spoken out. In 2009 it criticised Prime Minister Bruce Golding and Opposition Leader Portia Simpson Miller during an earlier debate on the Charter of Rights where, similar to such debates in several African countries including Kenya, the 'spectre' of gay marriage was raised. The two had reached for "the lowest common denominator and played to the gallery" it said, making "an appeal to their ever-narrowing political base." "The fact is, Jamaica is deeply homophobic, or pretends to be. Homophobia attends the country's sense of machismo; it frees us to go gay-bashing, and not just figuratively. Indeed, the week before the MPs began to sing their platitudes to the Charter of Rights, a young man was attacked by a mob for his perceived effeminate gait. Happily, he was rescued by the police, for which he might count himself lucky," they wrote. The Charter has been criticised not just for its failure to cover sexual orientation but also disability and language, in a country where Creole is a major tongue and also a source of discrimination. "We understand why the various commissions, committees and legislators who drafted the charter failed to expressly declare people's rights to freedom from discrimination based on sexual orientation." "It has do with the receding, but still-entrenched homophobia in Jamaica that caused Mr Golding to declare, more than three years ago, that gays would not be welcome in his Cabinet. Politicians fear that any perception that they embrace or are soft on homosexuality will cost them votes and open them to discrimination and stigma." "The attitude, we insist, is cowardly, retrogressive, socially dangerous and offensive to human rights." "To be clear, our position is neither an endorsement nor rejection of homosexuality. Frankly, we do not care. How consenting adults choose to live their lives is none of our business. There are, however, a couple of things that concern us and which we believe should be the concern of all Jamaicans." "First, while we note and commend the advances in individuals' rights contained in the charter, we are aware that the possibility of discrimination against any group is a toehold for the erosion of the rights of others, notwithstanding the cover of constitutional protection." "Moreover, the fear of stigma, discrimination and violence pushes many people into the closet. Their talents are often underutilised, to the detriment of the society and economy. There is evidence, too, of the health problems faced by gays, many of whom prefer to live without treatment for their illnesses, including HIV/AIDS, for fear of discrimination. The public-health risks are obvious." "It is nearly 50 years since the promulgation of the Constitution; waiting a few more months [which has been proposed in the Parliament] to get a better charter won't hurt." "Improving the charter will require that it lie in the legislature for months in accordance with the time stipulation for amending the Constitution. In the meantime, legislators should expunge the buggery law, the main bit of existing legislation that makes homosexuality illegal." The Editorial attracted 22 comments online, many of them positive. Jamaica's major gay group J-FLAG called on the Senate to include language protecting not just LGBT but also persons with disabilities and persons affected by particular health conditions such as HIV. At a minimum, it suggested that the Charter simply includes the statement ‘the right to freedom from discrimination'. 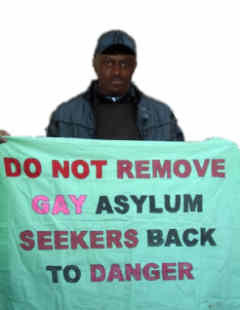 It noted that at last month's Universal Periodic Review at the United Nations of the state of human rights in Jamaica that the government had claimed that: "Jamaican law [does] not criminalise [sexual] orientation nor does it condone discrimination or violence … and was committed to ensuring that all citizens are protected from violence." Astonishing, at the same UN meeting, the Jamaican government claimed that it would "start a public information campaign to combat discrimination based on sexual orientation." JFLAG's work on the Charter has been criticised by other Jamaican activists as too late. The author of the GLBTQ Jamaica blog - 'H' - suggested that the current push in Parliament to pass the Charter bill was "with a view to meet the United Nations Periodical review." "[A] last minute petition doesn't seem to have yielded much with only a dreary 413 signatures despite [JFLAG's] worldwide appeal that it still falls back on as locally more and more persons are just becoming fed up with their lack of presence and growing ineffectiveness. through all those two negatives they restructured with an Executive Director position and a new Programs Manager and still limp-wristed. If you guessed it well some are angry right now," 'H' wrote. Pink Report Jamaica asked, "what could have possibly occurred such that the [Parliamentary Committee on the Charter of Rights] could have been left with the impression that JFLAG was willing to barter inclusion of rights protections for minorities with repeal of buggery and related laws and what has been done since 2001 to educate members about inter alia the Charter and Rights in general." "The Bill is now at the floor of the Upper House, the Senate. Whilst the Leader of Opposition business in the Senate, Senator A.J. Nicholson has already indicated the total support of the PNP [People's National Party] benchers he has called for a complete discussion on the Bill’s provisions among the Senators. This delay represents the last real opportunity that JFLAG and the wider Gay community has for initiating amendment to the Bill, which we are aware of. We humbly submit that the time has come for all members of the community to unite behind whatever initiative that JFLAG chooses to engage the Members of the Senate. We propose that a Great Email Campaign be done where persons directly email senators with content to be provided by JFLAG."